I have multiple objects on top of each other in various layers. Now I would like to export a version of my file where only the visible parts of all the objects and layers will be included. How do I proceed? Thanks a lot! 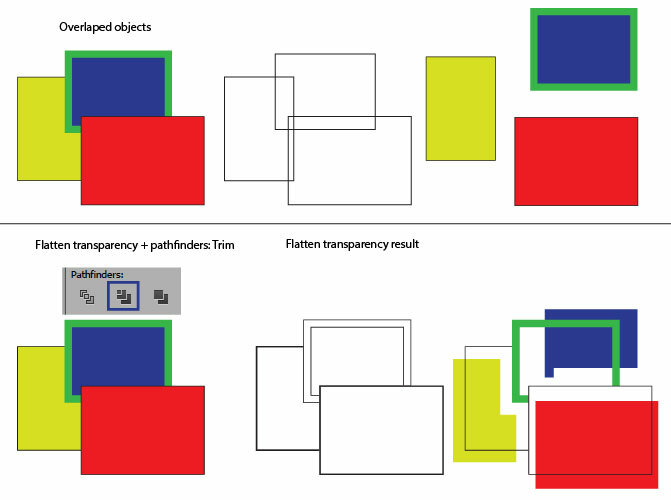 Select all your vectors, go to Object>>Flatten transparency. This will make all vectors closed, so the outlines. This wil make a top object cut all the objects behind it and so on. Not the answer you're looking for? Browse other questions tagged adobe-illustrator vector flatten or ask your own question. In Pathfinder window, what is the difference between a shape mode and a pathfinder? How do I flatten this vector logo leaving only the visible black paths? There are invisible blue boxes on my artworks that I can't delete them in Illustrator CC 2018!